When we set up Seibiant as a shop and a business, we were keen to keep our carbon footprint as small as possible, the catering industry being notoriously bad at recycling. You may remember that in the beginning we were a café, but just serving cakes and toast. All our organic waste went in a food waste bucket and went to the allotments in Llanfairfechan, and we then got veg back from them, which we used to make cake – the vegan courgette cake was lush. Even though we are no longer a café, our spent coffee and tealeaves still get recycled, and I’m hoping that in due course, the allotmenteers will be persuaded to try growing tea for me, although we have a lot of research to do first. I’m still very proud to say that our weekly rubbish is tiny, probably less than half a bin bag every couple of weeks. A future venture for Seibiant is Seibiant Sebon, and the plan is to use our spent coffee grounds as part of our soaps and scrubs. All our takeaway cups are compostable, and we’re happy to take back any used cups you’ve had from us, so long as they’ve been rinsed clean. The company we get them from claim 12 weeks to break down completely, but we find they take a little longer than that. They’re made from plant starch rather than plastic, so break down easily enough in your food waste. If you bring your own takeaway cup, you get a 10% discount on your takeaway drink. We will soon have our own takeaway cups/keep cups for sale with our logo. We’re also more than happy if you bring your own tea and coffee caddy from home, and we can refill that with your favourite brew, again for a discount. All our paper and plastic waste is recycled, and we buy our packaging from companies that share the same philosophy, even though they tend to be more expensive. Coffee bags continue to be a problem – the bag may be recyclable but the plastic valve generally isn’t. You may be aware that all the furniture in the shop is recycled in some way, Pete Griffiths made our counters and bar/bench, mirror, and tasting table, and other furniture came from the previous shop or from Freecycle. The mug display came from Vinomondo, and the noticeboard pallet was delivered with our crockery on it when we set up the shop. Remember the Map Chairs? They came from the Occupational Therapy department of a local private hospital, where they upcycle old furniture and give it a new lease of life. If you want to take away some of our compostable waste, just call in or message us on here or on Facebook, Twitter, Instagram and we’ll save a bag for you. The website has now been up and live for a few weeks, and I’m still learning how to use WordPress. I thought I’d share our philosophy and motivation in terms of speciality coffee. 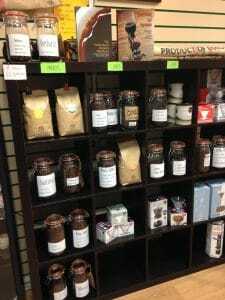 People are becoming increasingly interested in the provenance of their food, and the craft involved in producing it. At Seibiant, we want to work with roasters who share our philosophy, focussing on direct trade with farms wherever possible. This provides the means to uphold and build quality at every stage of the coffee production, from farm to cup – in the words of Poblado, one of the roasters we work with – “Teg, o’r llwyn i’r felin” – “fair, from grower to grind”. The ethical nature of the coffee industry has created a culture of international collaboration and knowledge-sharing, led by innovative, vibrant young businesses. At Seibiant, we are proud to be involved with some of those – local roasters Heartland from Llandudno, and Poblado from Groeslon, were the first roasters who provided us with much needed guidance on coffee, machines, and the speciality coffee world. Once we opened the shop, we have made other contacts, including the very new and young McCarthy Jones Coffee Co, from Wigan, who are so small, they only have one type of coffee at a time – Sulawesi at the moment – and boy do they know how to roast it! But because they are so small, we become very much aware of the seasonal nature of coffee – the Sulawesi is almost finished. Poblado’s Karimikui from Kenya is now actually finished for the season, and we have the last few grams of it left in our grinder hopper, as our house espresso. 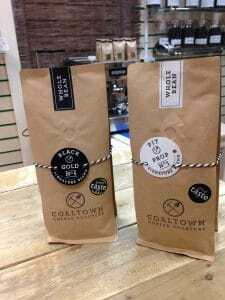 We recently made contact with Coaltown Coffee Roasters, from Ammanford, who are our guest roaster currently. I’m working my way through our selection from them, the Nicaragua, El Salvador, Brazil and the amazing Decaff, Jenkin Jones. I also have a challenge – I need to select our next house espresso from Black Gold, their signature espresso blend which won 2 gold stars in the UK Great Taste Awards 2014. This is a blend of Brazil, Colombia and El Salvador, so a big ballsy coffee. The alternative is Pit Prop, Coaltown’s second espresso blend which also gained 1 star in the 2015 Great Taste Award, this is a blend of Nicaragua, Guatemala and Sumatra, so more chocolate/orange flavours. I’d appreciate your help with this difficult choice, so if you call into the shop, and tell the staff member that you’ve read this blog, and that you want to help, and you can have a drink of one or both on the house. Tasting Organic and Biodynamic Teas … or did we?